Get festive clothing and costumes that will have you standing out at holiday gatherings from uglychristmassweater.com. The great crew they have over there hooked up ageekdaddy.com with some samples of the awesome selection of apparel available from them. 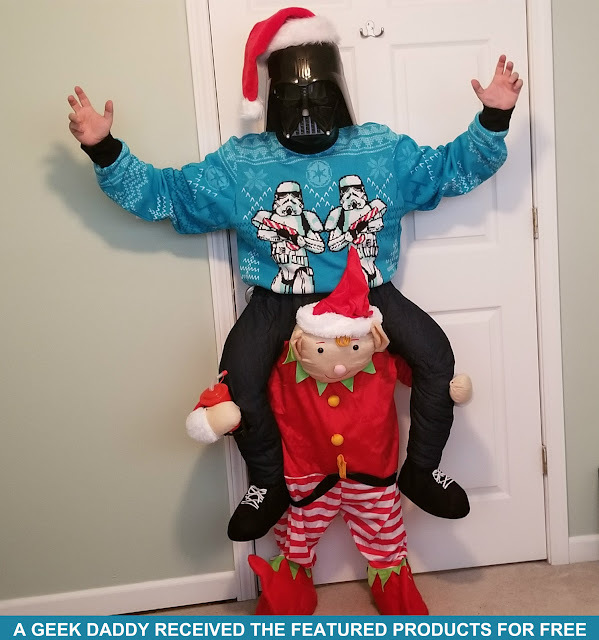 I'm going to be having some fun wearing the Star Wars ugly sweater, LED ornament sweater lights, and Piggyback Ride On Elf costume at a number of festivities. Uglychristmassweater.com has a wonderful variety of fun and funny stuff for spreading holiday cheer. Have everyone rolling on the floor with laughter at your next holiday office party or family gathering when you show up looking like you are riding piggyback on an elf. The Christmas Piggyback Ride On Elf costume tricks people's vision so it looks like the wearer is sitting on the shoulders of a cute little Santa helper. A great way to add some merriment to a Christmas party! Jump on the ugly sweater trend by wearing one yourself to parties during the holidays. They have a great selection of Star Wars sweaters that caught my attention like this one I'm modeling with candy canes and the Imperial Guard! This officially-licensed ugly Star Wars Snowmen Stormtroopers Sweater will make you the hit at your next holiday party. 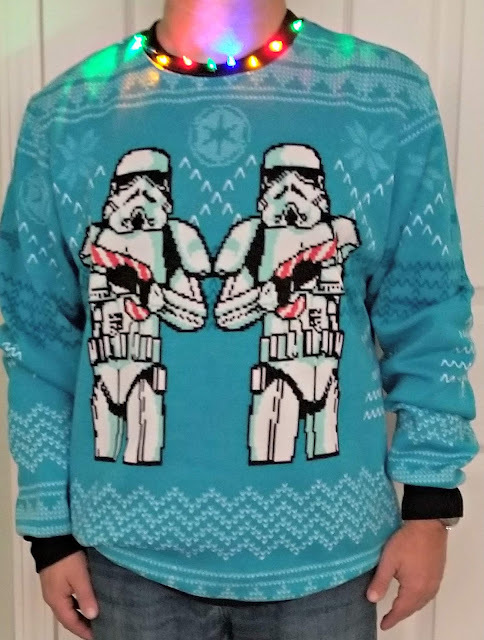 It features two Stormtroopers with candy canes instead of blasters on the front and a back side that features both TIE fighters and Christmas Trees. Other Star Wars sweater designs available at uglychristmassweater.com incorporate Chewbacca, Boba Fett, Darth Vader and Kylo Ren, Let your geek side shine during the holiday season! Add some shine to your holiday outfit with LED ornaments that mimic Christmas Tree lights. These provide a nice glow to any ugly Christmas sweater and have enough juice in them to light up for up to twenty-four hours. These specially-designed lights won’t damage your sweater either. Simply poke through a knit sweater and you’ll be light up the expressions of anyone who see you all lit up with this eight piece blue, red, green and yellow LED set. From sweaters with 3-D moose mounted on them to ones sporting the Rolling Stones' tongue logo there is something for every taste at uglychristmassweater.com. They can even make you a personalized ugly sweater that you can customize yourself. What would a sweater design you created yourself look like? I've been impressed by my uglychristmassweater.com experience and recommend you check out their online store. 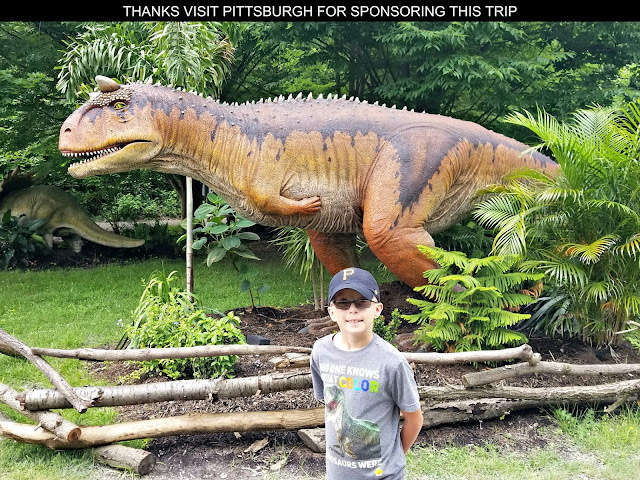 For more information, give them a call at 248-785-3615 [They are a Michigan-based business right here in the United States], shoot over an email, or follow their Facebook, Instagram, Twitter and YouTube. Have yourself a merry Christmas enjoying wearing an ugly sweater! A Geek Daddy was provided complimentary products featured in this blog post for promotional consideration by uglychristmassweater.com. Opinions expresses are my own.